During the 5th EuroSpeleo Congress which was held in mid August 2016 in the Yorkshire Dales in Great-Britain all important caves in the area were rigged to allow many teams having access to these fantastic holes. 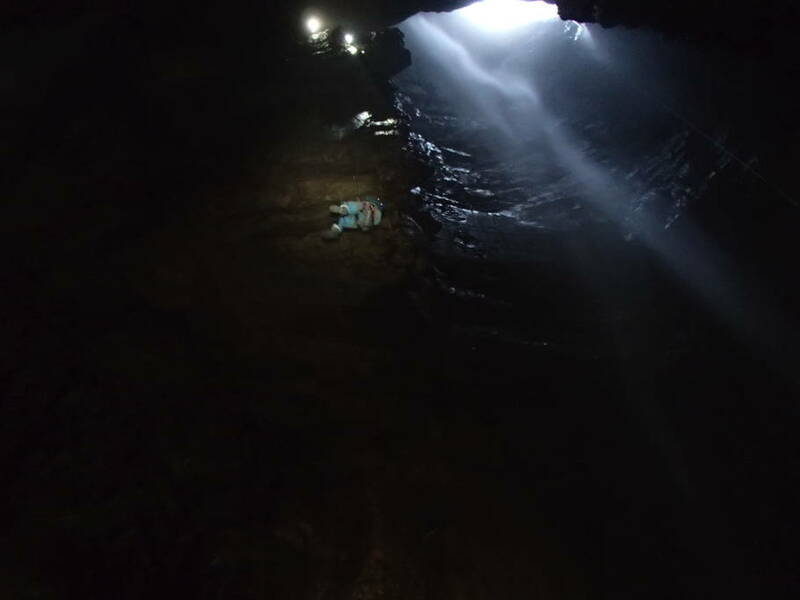 The Craven Pothole club had installed a winch for easy access to the main Chamber of the famous Gaping Gill, which of cause was too easy for the cavers and most used this functionality only to get out of the shaft through the highest ‘free falling waterfall in a cave in Great- Britain’. Our Luxembourg Team, Medy, Carmen and Jean-Claude have chosen the ‘Flood Entrance (Wades)’ to go down. This is a series of shafts ranging from 14m to 40m and we arrived at the bottom. What we learned here is that this was a dry cave, at least on the day we were down and yes our suits were wet. Dry caves here means the water can get as high as your knees, in wet caves however it can be as high as your neck! So we continued our way on hands and knees, always in a clean and washed out area in direction of the Main Chamber. This is actually impressive, high, large and extremely noisy due to the waterfall coming down and echoing on the bare walls. In the middle two green humans dressed in protective overalls, one could have the impression being on a film-set of a science fiction movie. For the crowning of our tour, we also choose the lifting via the 100m winches, which was an experience of its own.